Connect the devices to the computer. See guide Connecting Device to your computer for more information. Open the OpenField Console and select the 'Device Manager' tile. 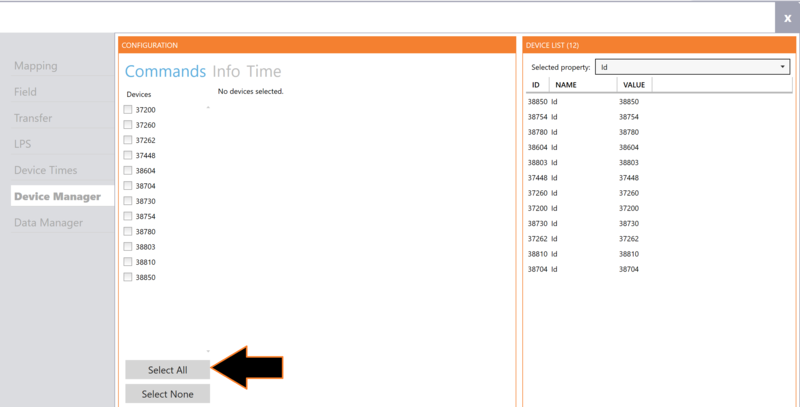 Click the 'Selected Properties' drop down menu from the Device List menu in the top right of screen. The battery charge state will populate beside each Device ID. You can also check the battery status of an S5 or X4 by quickly tapping the button, when the Device is on. The device will display up to three red lights. Three red lights means that the battery is charged and one red light means that the battery needs charging soon. The Top LED of an S5/X4 will go Green when fully charged, and connected to a powered charge case or single cradle. A T6 will have it's LED go solid when fully charged.